France has been pushing for effective access to China’s beef market after securing last year the lifting of an embargo that dated back to the mad cow disease crisis in Europe two decades ago. China has been loosening such longstanding restrictions on beef imports to feed the appetite of the country’s growing middle class for steaks and ribs, and has in the past couple of years cleared the United States and Ireland, like France a member of the European Union, to export beef. China is now the world’s second-largest beef importer, taking in almost 700,000 tonnes of the red meat in 2017, worth about $3.3 billion, with volumes up 20 percent from the year before, according to Chinese customs. Monday’s technical agreement on hygiene and inspection requirements, signed during a visit by French Prime Minister Edouard Philippe, means France will be able to export to China once meat companies that have applied for access receive their permits. China’s proposed retaliatory tariffs against a range of U.S. goods including beef could also help France by stalling U.S. shipments after they resumed last year. The agreement came after Macron had pledged during a visit to China in January to obtain market access within six months, and offered a trade success amid inconclusive discussions to sell Airbus aircraft. 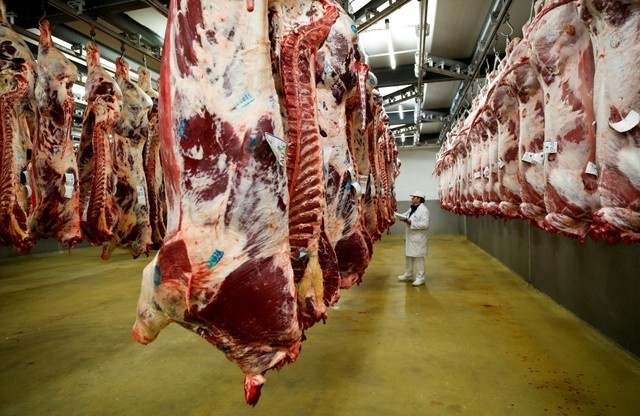 French meat industry association Interbev said it expected actual beef exports to China to begin in September, after China has granted licences to seven slaughterhouses that have applied. The import agreement signed with Beijing allows France to export both chilled and frozen beef, it added. The exports could bring relief for beleaguered French cattle farmers who have been struggling for years with low prices linked to declining domestic consumption of beef and cheaper foreign supplies.